I have been riding with my husband on the back of his bike now for 3 years. I never thought I ever wanted to get my own bike. 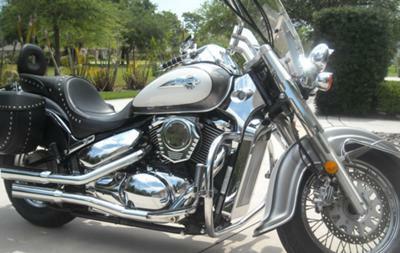 I got my license and now I am a proud owner of a 2003 Suzuki Intruder Limited Volusia. It has every chrome option you would want on your baby, and I have to say thank you honey for making my dreams come true, I just love this bike and its all because of my husband. Chrome don't get ya home baby. What do you shine the chrome with, I have a few rusty bolts and would like to get them cleaned up. Beautiful bike.